Once again, I missed linking this up to a challenge. Fortunately, I made it for two challenges, one of which isn’t over yet! Yeah! Not much to tell here. 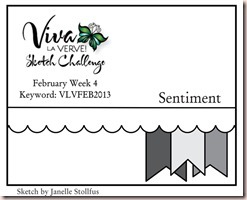 I used last week’s Retro Sketches for the layout. The other challenge is Joan’s Gardens weekly challenge to use pink and white only, something curvy like a flourish or vine and a flower of some kind. Check, check and check! I added some colour to the vertical piece of DP because it was too much like the background using a blend of Tattered Rose and Spun Sugar Distress inks. The colours don’t look like they match so well in this but I promise, they do IRL. The stamping isn’t at all peachy like it appears. Wish I knew more about photo editing. So, I had to give this 10 minute thing another shot. Let’s just say I failed miserably (but I did get quite a bit closer, more like 14 minutes). Even though I prepped the heart embellie in advance… that’s not cheating right? 🙂 I can’t do anything quickly apparently. 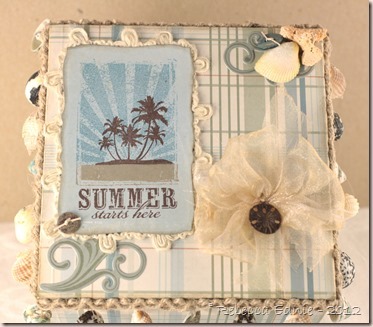 Sponging even takes me a long time! I think there’s a reason why you don’t see shabby chic cards among the 10 minute craft dash team cards or in the linky creations! 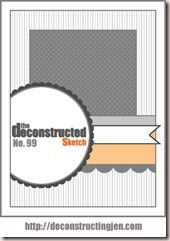 This time I used this week’s deconstructed sketch 117. The basics of it anyway; I didn’t follow it to the letter. I now see I put the rounded edges at the top and I didn’t layer the two main panels the same way but I hope it’s close enough. When I set about to colouring the image, I realized I hadn’t used chocolate anywhere yet so the blanket ended up dark brown. And I added a chocolate button too. It’s a bit hard to see under the twine but it’s there. I die cut the heart out of corrugated cardboard then added a soft yellow/ivory paint to the edges. While it was still wet I added some micro fine white glitter. 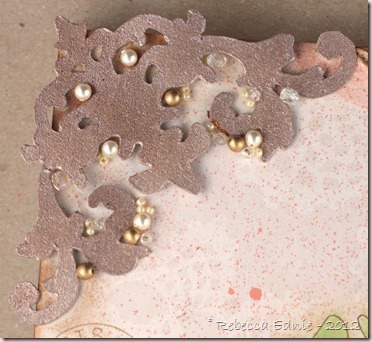 Then I added glue to the very edges and gold opaque glitter. The button threaded with twine tied in a bow was the finishing touch. 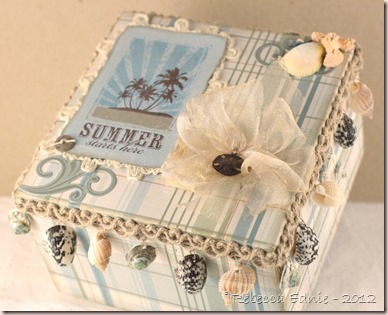 Stamps: Crafty Secrets: baby boy postcard set, background stamp-Hero Arts? 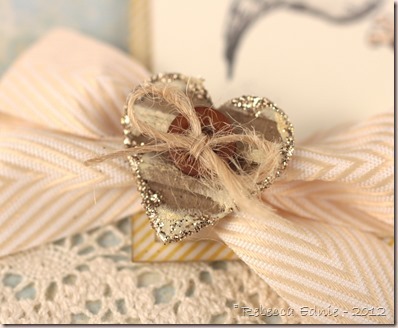 Accessories: heart die, button, twine-PTI, paint-buttermilk Americana, warm white glitter-Glitter Ritz, gold glitter-Art Institute, ribbon-May Arts, foam dots-Jody Morrow, corner rounder-WRMK, lace-not sure, maybe WMS? 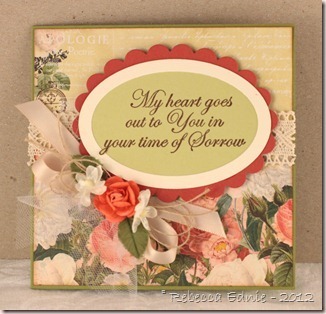 I am NOT a quick card maker. I could be but I just don’t like to be. I always want to add one more thing or colour something instead of just solid stamp. 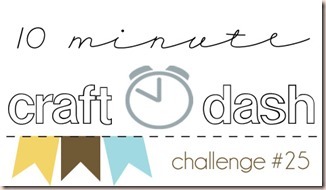 So when I tried to make it under 10 minutes for the latest Craft Dash challenge… well, they don’t call it a challenge for nothing! I used the latest Mojo Monday sketch for the basic bones of the card. And I rushed, or tried to. I’d never used this solid stamp before and did I remember to try it out first or condition it? Of course not. So when the Memento ink I’d set out didn’t seem to give good coverage, I pulled out my brown Archival ink and inked up the stamp, d’uh, I wiped it off because I planned to Copic colour it. More wasted time. So I finally chose my new, never tried but much touted (by Jennifer McGuire and Kristina Werner) Hero Arts Shadow ink in Cup o Joe. It still didn’t stamp cleanly! Ugh! I will give the ink another chance with a better conditioned stamp. I wasted like 4 minutes on that fiasco though and fixing the bad stamping with a marker. Overall, took me at least 25 minutes to make this card. I’ll still link it up because the rules say you can anyways and I loved the colour combo. You’ll see in my next post, I tried again and got closer but still didn’t make it. UGH! Click on either photo to visit the challenges. 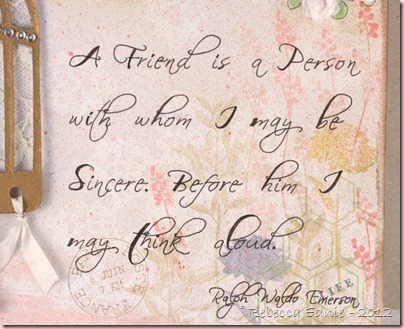 Friendship Canvas–My First Try at Mixed Media! 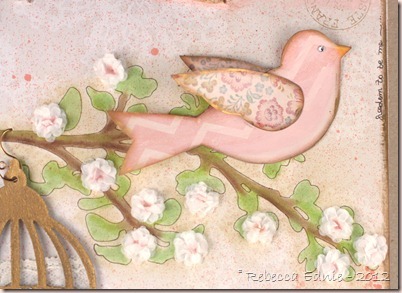 I’ve been inspired by many bloggers I follow who have been getting into mixed media art lately. After all, many of us already use quite a few different media in our work so it isn’t that big of a leap to venture into what is traditionally known as mixed media artwork. 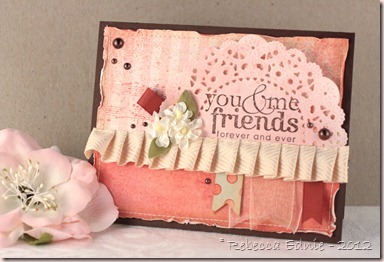 We card designers already combine ink, paper, ribbon, metal, sometimes paints, chalk, pencils, spray ink, fabric and more. 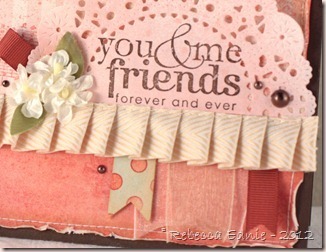 By adding a more permanent base than card making affords and mixing these media in new ways, voila! Mixed media art! This is a crazy long post so grab a cuppa and get comfy. If you don’t have time to read it all now, I really hope you will save it and come back later. 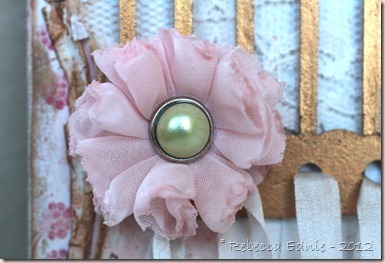 I have a great tutorial, a mini flower tutorial and some awesome tips all for you below. Plus a way to win by commenting! 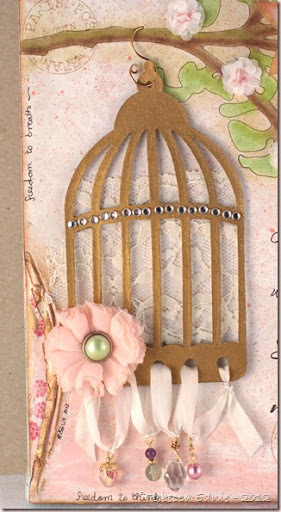 To make the bird, I drew the template myself, basing it loosely on Tim Holtz bird from the bird cage die I used. It was too small so I wanted to enlarge it and couldn’t be bothered figuring out how to make my printer scan and enlarge it. I’d normally get hubby to do it but he was watching the baby so I just winged it (get it, winged it! hee hee) The chevron stripe was lovely but too prominent for me so I painted over it with Porcelain doll MS acrylic paint. 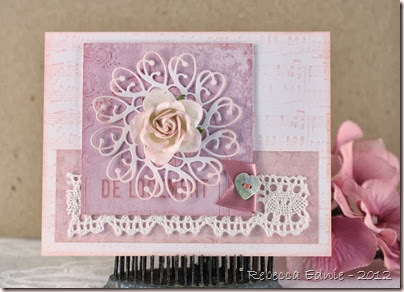 A pretty pinkish-ivory off white colour which toned down the paper nicely. I also used some pink paint in places to give the bird some depth and keep her from looking flat. Then she also got some Vintage Photo Distress ink and gilder’s paste on the edges. The wings got Porcelain Doll paint only on them, again to tone down the pattern. 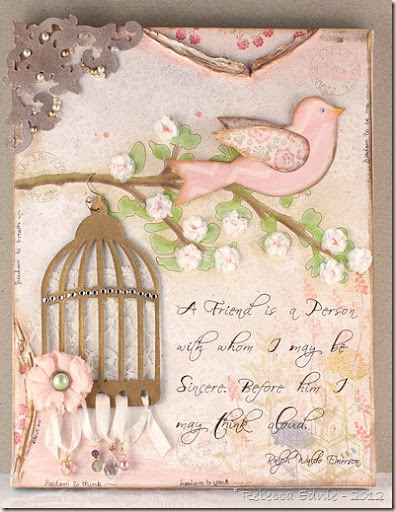 The bird cage was cut from grunge paper and gilded with a tube of gilder’s paste. Use it sparingly! 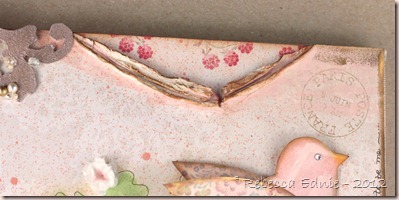 I also used this on the edges of the canvas and on the torn/pushed back edges of the paper along the edges. Gilder’s paste is wax based gold you can apply with your finger or a sponge or a q-tip. It is very shiny (hard to tell from this angle but check the last photo with the flower) but I did buff it so you may be able to get a less reflective finish depending on how you work with it or the surface it’s applied to; I don’t know as I don’t have a ton of experience with it. I love how it turned out. I used wire and head pins to attach the beads at the bottom to silk ribbon which I threaded through the holes in the bottom of the bird cage. They are so much more twinkly IRL. I’ll talk about the flower later. I was looking though my vast selection of junk stuff goodies when I came across some vellum quotes and this one really resonated with me. I’m a very direct, outspoken and honest person and people who aren’t drive me CRAZY! I’ve never understood why everyone can’t be the same! I’ve had huge problems with making and keeping friends, especially as a teen and it took me a long time to figure out I was trying to make friends with the wrong kinds of people. So now I have friends who are near and dear to my heart, who truly listen to me and understand me, who I can really be open with and not think so hard all the time if they will judge me for what I’m about to say, I can just breathe and say what’s on my mind; this is one of the things in my life I cherish most. So I knew this quote had to be translated into something that I could see everyday, keep it close by and in a place where it could help me remember to always appreciate those friends. I chose the font, Scriptina Pro, which I found for free, then I typed out the quote and formatted it until I was happy with the spacing and size etc. and I printed it out. I transferred the text to my canvas and went over the transfer with permanent, lightfast, archival pen. Then I thickened the lines in some areas to add more interest. It was looking a bit flat and boring with all the same thickness of lines. Be sure not to use a water-based marker for this kind of work as it will fade much too quickly. (In retrospect, I used water-based inks in other places and probably shouldn’t have for the same reason but it’s going in a place with minimal sunlight. Pigment inks are more lightfast.) I don’t have a photo tutorial for this transfer technique but it’s a great way for getting the text onto your canvas and it’s not hard to describe. 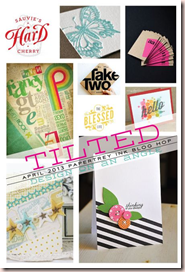 Print your wording or design on regular copy paper. Flip your paper over on a light table or bright window. Using a wide pencil like 0.7mm lead or wider (regular is 0.5), trace your design. Make sure you cover everything. Going outside the lines a bit is ok, just make sure everything is covered. Trim any excess paper around your design if needed. Tape your paper to your project making sure it is lined up perfectly. Use repositionable tape like Scotch brand or washi tape, Eclipse tape or painters tape but if you are unsure if these may lift up any previous layers of colour/media you’ve added (like chalk, charcoal, pastel or Pan Pastel), please check in an inconspicuous area. Trace your design with a pencil. What size you use will depend on the thickness of your lines. For fine lines like mine, not only did I use the finest pencil lead I had which was a 0.5 mechanical pencil, I kept rotating the lead to always have a sharp point. If your lines aren’t so fine, this may not be so important. You could also use some other writing tool as using a pencil isn’t crucial. could work so experiment. Maybe an embossing stylus? Tip of a bone folder? The line you will get is quite faint so if your eyesight is poor you may need magnifying glasses, a strong light, a magnifier attached to a lamp or otherwise or this technique may not work for you. Because the surface of a canvas is fabric (of course) and not stable, I did have to jam some stiff cardboard into the space between the fabric and the wood to get a hard surface to write on. Several pieces actually. I used laminated pieces that some with Spellbinders dies and they were perfect and slid in nicely due to the lamination. This is a version of a technique I learned as a kid on school. We covered the back of what we wanted to transfer in pencil by scribbling back and forth very heavily. The con of this technique is that is leaves a lot of hand smudges as you do the transferring. With my technique, there is so little graphite on the back of the paper, I didn’t notice any smudging at all. I hand cut the corner by tracing a template I bought from Tattered Angels AGES ago, back when spray misting was in it’s infancy, and cutting it from grunge paper. 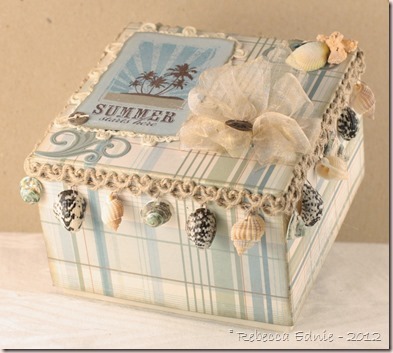 I then painted it with highly lustrous pearl finish white paint by MS and covered it with Vintage Photo Distress ink which turned it into a cool metallic look. However, the ink isn’t stable on the paint despite two coats of fixativ so I don’t recommend this and I won’t be doing it again. Next time, I’d mix colour into the paint or buy a pearl finish paint in the colour I want rather than trying to alter it after it was dry. Then I added various beads to the nooks and crannies which was shamelessly CASEd from Gabrielle P, a designer for Maja Designs. Another shamelessly CASEd part of my canvas are the torn bits with contrasting paper underneath. To do this you must moisten the paper quite heavily and treat it firmly but gently while pushing it back and expect it to crack in at least one place. You can mist your paper but I used a q-tip to control the amount of water more carefully. Then start to wrinkle the paper. Start as if you only want a tiny area pressed down, don’t try to do too much at once and add more water often if you need it. If the top layer of the paper starts to pill, you have too much water, up to that point, you can’t have too much water. Gently scrunch it until you have the look you want. Many artists I’ve seen cover up the broken/torn area with flowers or ribbon but I liked it and felt I had enough going on with out adding any more. I made this flower and it came about rather serendipitously. I was trying to replicate another type of flower but changed too much and it didn’t work out well. I wasn’t happy with it at all so I decided to hit it with the heat gun and all of a sudden, I though it was so pretty! So, I will refer you to the original tutorial then tell you what I did differently. Firstly, I used sheer fabric called georgette, not tulle and I cut them with pinking shears, not the way she called for and I cut 9 circles. I folded them like she did, in half first but then but I overlapped them in the center a bit more almost into thirds. However, this allowed all 9 of them to fit next to each other when sewn onto the backing. At this point, I really didn’t like the finish that the pinking gave the edges. To me, it just looked sloppy. So I hit the flower with the heat gun. At times, I separated one little section from the others so it wouldn’t melt too much or so I could melt it more as it seemed to get missed. In the end, it almost seemed like those flowers made from lots of little blossoms and I really liked that. The base of the canvas was prepped with acrylic paints on the sides in pink, turquoise and porcelain doll. Then I added some script stamping and toned it down with more porcelain doll dry brushed on. The base of the canvas is hard enough to see IRL and almost completely lost in photos. I used a lovely lace pattern DP then added some spray mist in Boss Lady which is much brighter and more dominant than I had hoped. Two light sprays from far away and my background was almost gone. You can see a wee bit of it above. 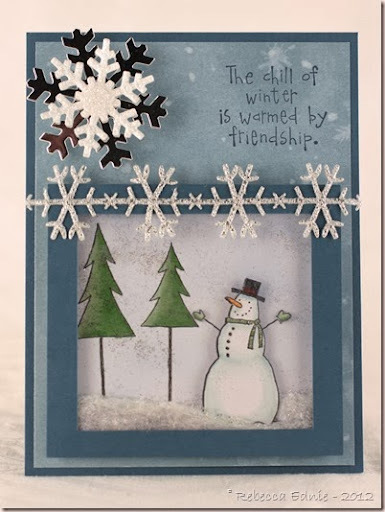 The lower right corner is a mix of Life stamps in various Distress inks and a few PTI colours along with some Hexagon stamps which you can see in the photo with the lettering. The tree stencil was tacked down and sponged around the outside using Antique Linen Distress ink then traced around using the same pen I used to trace over the lettering. Then I used PTI inks to dry brush the colour onto the tree. To do this, you literally pick up colour from an ink pad with a dry watercolour brush, yes, it does take a long time but it game me the soft look I was going for. Then I die cut a TON of tiny white 5 petal tissue paper flowers and glued them together, I think 10 layers or so. Then I glued them to the tree, added chalk to the centers and fluffed them up to create spring flowers. This can all be see in the photo with the bird. hope you stayed with me this long! If so, you are a real trooper and deserve a medal! Thanks so much! 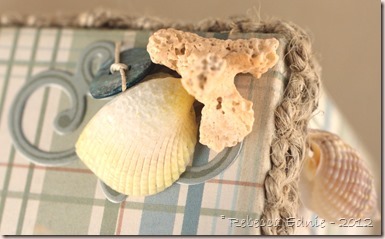 I’m entering this in the Spring Home Decor Challenge in the Moxie Fab World. It’s randomly chosen so I have as much of a shot as the next person but I’m so proud of this I can only hope maybe there could be an Honourable Mention of something. If you like it, I hope you will leave a comment. If you do, you could also win a prize as one of the ways to win this challenge is to leave comments for participants! Click the link to learn all about it. Not long left so be sure to join in the fun! I am really proud of this one. It’s been ages since I used my old stand by of pink and brown. Feels good to come back home! I have a few tips for you in achieving this shabby look. 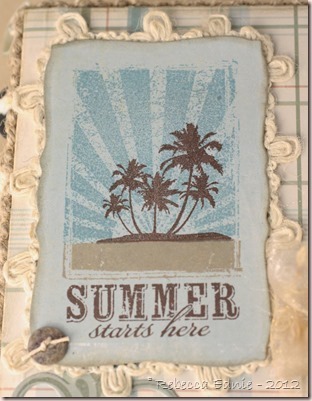 Tip 1: To get a beautiful distressed edge, add water before rolling, squishing and pressing the paper. It’s a softer look that just shredding the edge with a distresser or scissors or your nail. 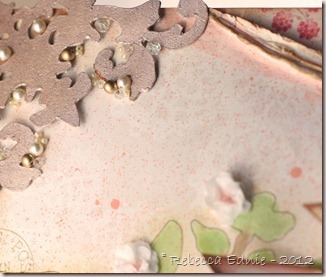 The opposite side of the paper will show which is a lovely, shabby look. I used a Q-tip and water with Perfect Pearls in it. Never pass up an excuse to add some pearlized water! 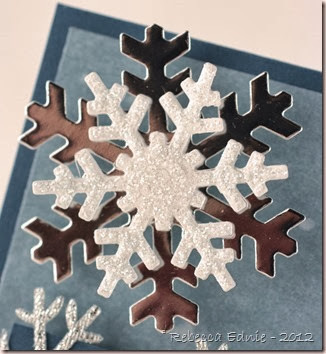 but you can add some ink in it to colour the white edges if you wish, either to match your paper or a brown for distressing. If you want some torn sections, do that before or after because it won’t tear well while wet! See photo below for some close up areas. Tip 2: Spritz with diluted colour mist using pearl water. Just a little bit gives it an aged, stained appearance. It can be subtle but really helps bring the card together. 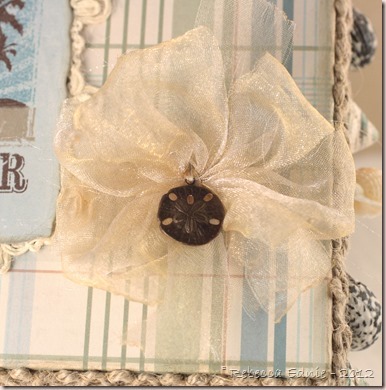 I used it on all the corners except the ribbon banner corner. Fill a Mini Mister by Ranger about 1/8 full with water and to 1/4 full with ink. Test and adjust until you like the intensity. You may need less darker inks and more lighter ink. Tip 3: When you look at a sketch, think beyond your initial impression of what items should be used for a particular component. The horizontal element in this case was a scalloped strip. I could have gone with a scalloped punched paper strip or a scalloped edge ribbon which would have been even more interesting. But this ribbon treatment is miles above both of those IMHO. And if you immediately thought of ribbon for the banners, try thinking of ribbon next time. Or vice versa. What is even more interesting is combining them!! 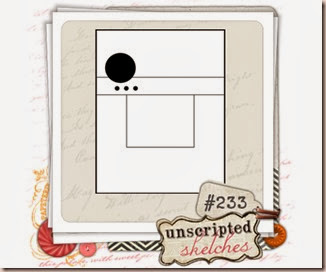 Tip 4: Stamp on non-traditional surfaces and in layers. Stamping on the doily didn’t turn out perfect but that’s what I wanted. The tips of a couple letters ended up on the holes and the texture isn’t perfect (part of the stamp too) but it looks vintagey! 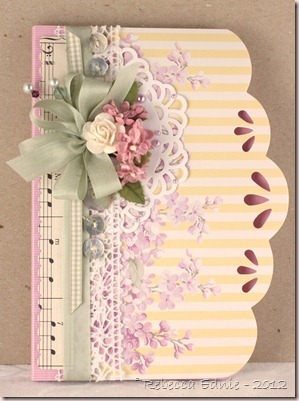 I also stamped the music on the striped paper which already had some texture on it from the manufacturer. If it hadn’t, I would have added some texture or script or something to it. Tip 5: This isn’t specifically a shabby tip but a general tip. Cut apart or unmount that wheel stamp you never use! They are cheap and a great source of images. I now have 12 different words and 2 or 3 images! I wouldn’t have used that wheel hardly ever! (I bought it knowing I would cut it apart based on someone’s recommendation) The music image I used is also a wheel I unmounted. I leave it naked, no EZ Mount even, so I can apply it freehand which gives it a shabby or grunge look depending on how much ink I use and how dark the colour is. Do you like the tips? The angled photo with props? These are also changes I’m considering trying out though it may seem slow to adopt as I use up some older photos. Let me know. Only though feedback can I make sure you get what YOU want out of this blog! Stamps: music wheel, friendly words wheel-SU!